Enterprise Information Management (EIM) is the combined power of analytics or business intelligence and content management. Large companies often have separate applications for each of these segments, and EIM seeks to combine them in a more integrated way to remove silos. Organizations that are developing EIM strategies and capabilities are focused on reducing costs and improving efficiencies. The major growth drivers for the EIM market are increase in unstructured data, new regulations, rise in cloud computing, upsurge in big data analytics, and organizational drivers such as customer services, marketing opportunities, process improvement, and fraud detection. Moreover, most organizations are under pressure to ensure complete data security, along with reduced costs and improved efficiency. This has prompted businesses to adopt cloud-based information management infrastructure as it has benefits such as low cost with minimal IT infrastructure support, rapid and predictable implementation, automatic and seamless upgrades, and ease of leveraging cloud‐based data across organizations. The growing need for real-time reporting is a significant trend anticipated to propel the EIM market in the coming years. Changes in business models and increased mobility in terms of workforce and device management have a major impact on the reporting process of organizations. Analytics and reporting have become an essential part of data management to get meaningful insights into the company and customer data. This helps administrators to not only analyze content but also monitor and control the accessibility of content from remote locations. The global EIM market is highly competitive with many niche players foraying into the market space with innovative products. The established vendors are facing stiff competition from new entrants across different categories and the competition among the vendors is expected to further intensify with several mergers and acquisitions and market consolidation. 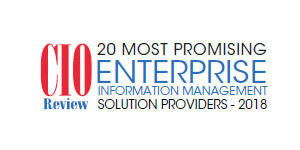 Keeping that in mind, CIOReview has chartered out top 20 companies offering tailor-made and efficient EIM solutions.